A week or so ago I picked up a rather sorry for itself looking succulent in Homebase, that had been reduced to £2 because some of the leaves were rotting. I love Homebase for bargain plants, the ones I bought for my pallet garden revived themselves beautifully with a bit of water, and even before reductions I think they are quite well priced generally. I cut the dead leaves away, gave it a little spray and some time out in the sunshine, and I http://palletam pleased to report that it is thriving – unlike my aloe vera, which was also put out in the sun and forgotten about, and then caught in a torrential rain storm after which I could not dry the poor thing out, and alas, it is no more. Given that the echavaria survived, it needed a more permanent home then a cereal bowl, and I had seen some beautiful but expensive twine covered plant pots. I decided to try making my own with some cheap supplies. My local 99p Store had just the thing – a completely hideous pink and purple painted ceramic pot for, you guessed it, £1. I also got some PVA glue and some twine, bringing the total cost of this project to a huge £5, including the plant. 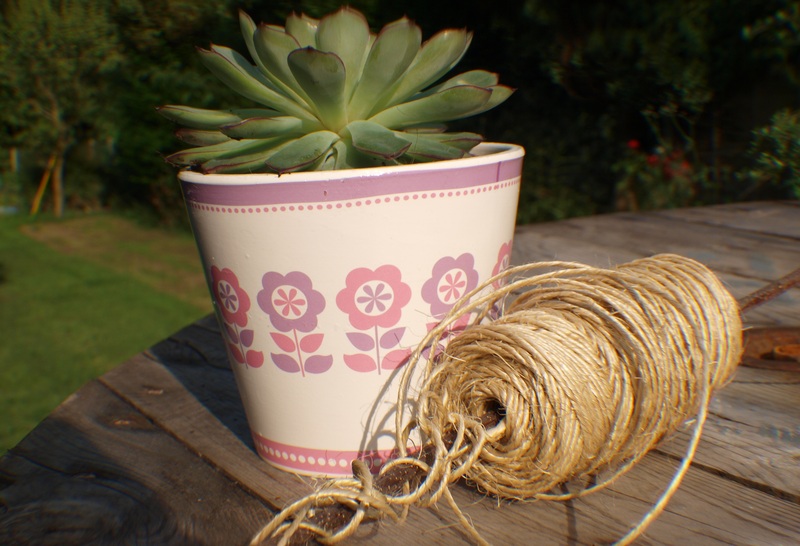 I took advantage of a rare quiet moment in the sunshine to transform my plant pot into something a little more attractive, by wrapping it with twine, probably the easiest DIY project I’ve ever done, but I love the results. Tarquin the cat also loved the amount of twine that was flying around, though he eventually lost interest and sunbathed instead, thankfully. 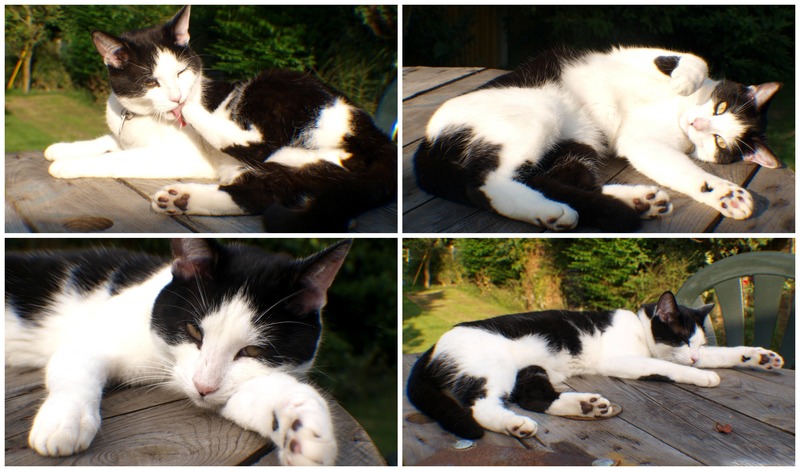 I spent more time photographing him than I did my project! First of all I gathered together everything I needed. The twig through the centre of the twine helped me to use one hand to unravel it as I went, the other to wind it round the pot. I put one end of the twig in the handy hold in the centre of my drum reel table so my twine unravelling was simple. I also got a pair of scissors ready for the end cut, and a stick with which to smoosh the glue around on the surface of the pot. I started at the bottom of the pot, covering it up to about a depth of 1 inch with PVA glue, which I spread around. Then I took the end of the twine and folded it up the side of the pot, and from there, wound it down to become the bottom layer of string. Leaving the pot standing at this point helped me to wind the layers of twine around without pushing the first ones off the bottom. When I got half way through winding, the bottom few rows were already dry, so I could pick up the pot and twirl it in one hand and the twine in the other. Be careful to push the rows down as you go, so you don’t get gaps. Some glue will ooze out, but don’t worry about this as it dries clear. Ste came to help me at this point – he turned the pot and I laid the twine, and the last part of it went very quickly! Getting to the top I wasn’t able to fold the twine under in the same secure way as I had done with the bottom, so I added some superglue to the last layer of twine around the top, and held it for thirty seconds, before trimming off the excess twine and gluing the last little bit down. I then left it to dry in the warm air in the garden, which took about half an hour I think, but really you should leave it overnight. I was too keen though, and had to put my succulent in straight away to see how it looked! 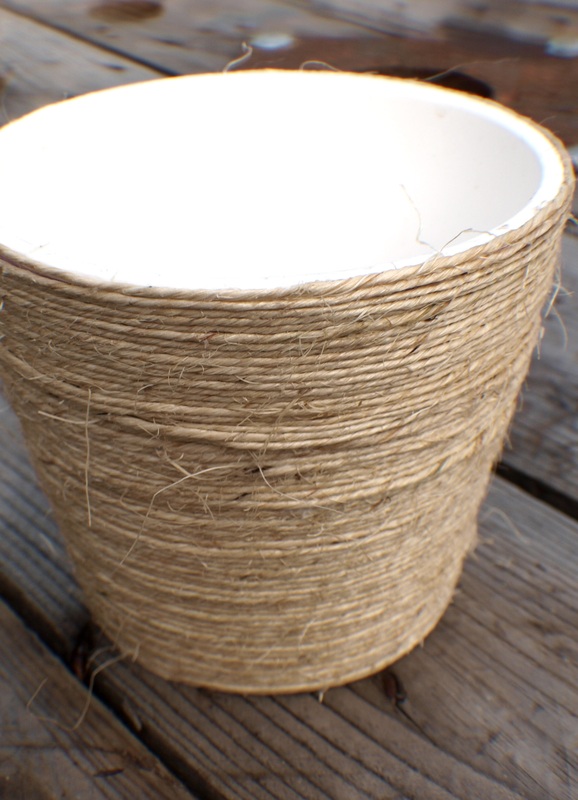 I was really pleased with the results – horrible pound shop pot to sophisticated twine pot in about an hour, including drying time. 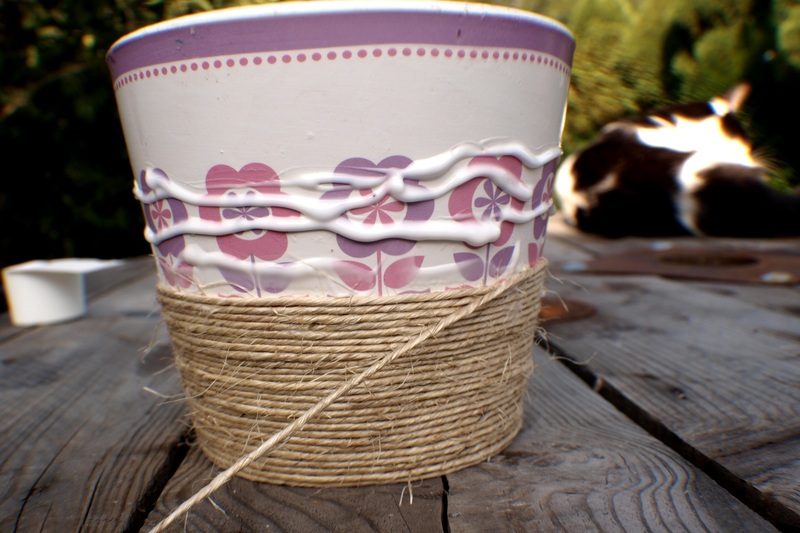 I wish all DIY projects were like this twine covered plant pot – quick, easy, and cheap, but the end result is really pleasing! What are your favourite simple DIYs? Please do let me know in the comments, and link to them if you like! Visit Cordes-Sur-Ciel: a Frenchman’s favourite French village!